From the look of the weekend weather report, there is light at the end of the tunnel. While I still am hearing from friends farther north that have snow, I am hoping our snow and plunging temps are behind us. Here in Zone 5b, our projected last frost date is May 10, so we will most likely get more “frosty” days but I sure hope not. There has been a great deal of winter damage around here. 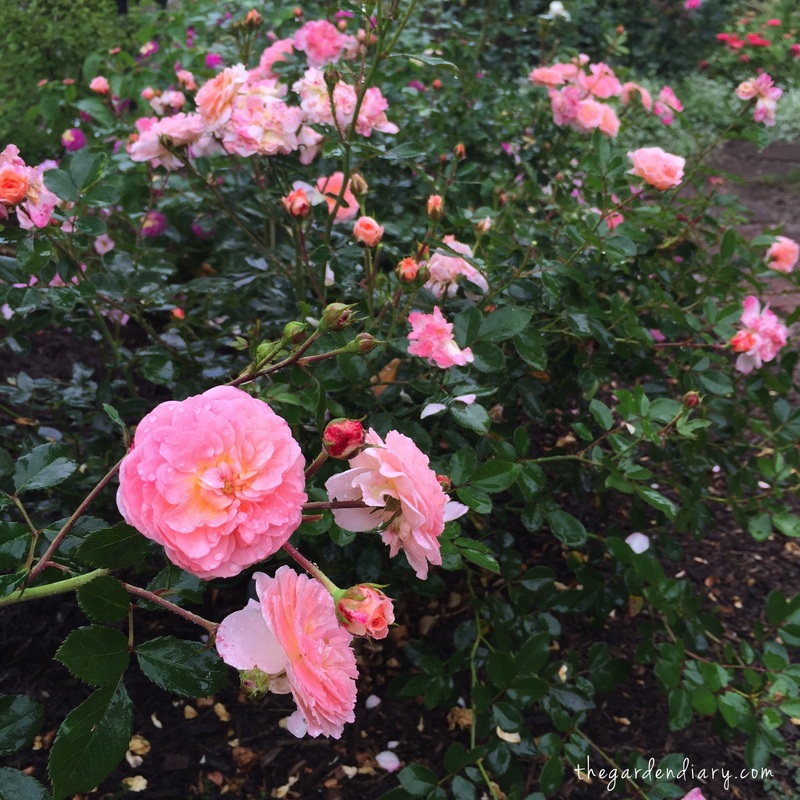 Most of the roses (except the old garden roses and rugosas) will be pruned down to about 2-5″ from the ground. There are 3 or 4 that look as though they will not be back. We have been here before — although not recently! While the start will be slower and the bloom cycle will be later, history tells me most of them will be okay — in fact many might enjoy the severe haircut. Last year by the end of May she was up and over the trellis. Not gonna happen this year. But, it will be interesting to see how the recovery goes. Me and Peggy… standing outside a lovely open door! My baby snapdragons — started from seeds I saved from last year’s beauties — had some time outside today. Behind them is my grandmother’s pitcher filled with mint that has been living in my potting shed all winter. I love this pitcher! My grandmother was a great gardener. The pitcher is a simple item she used in a very ordinary life but knowing that it was her’s, makes it extraordinary to me. The rugosas were little affected by the horrible winter. They are champs! 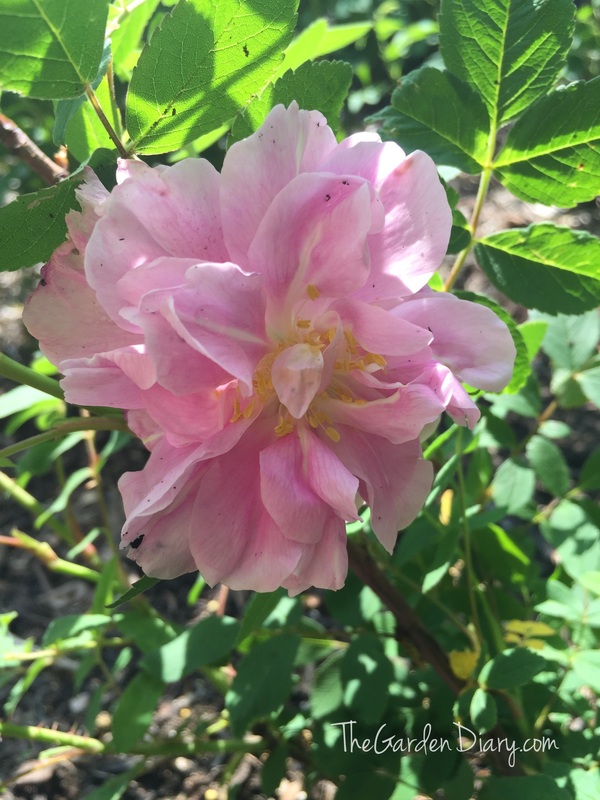 Here is Therese Bugnet Rugosa today…. All of these I would recommend. It was a wonderful day in the garden. Spring is finally springing and there’s so much more to come! 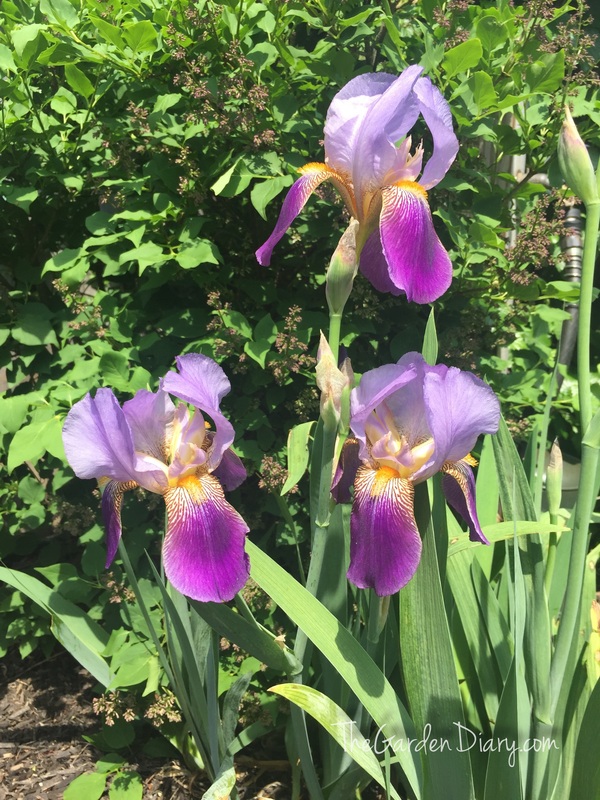 What are some highlights of your garden this week? I hope you enjoy every minute! 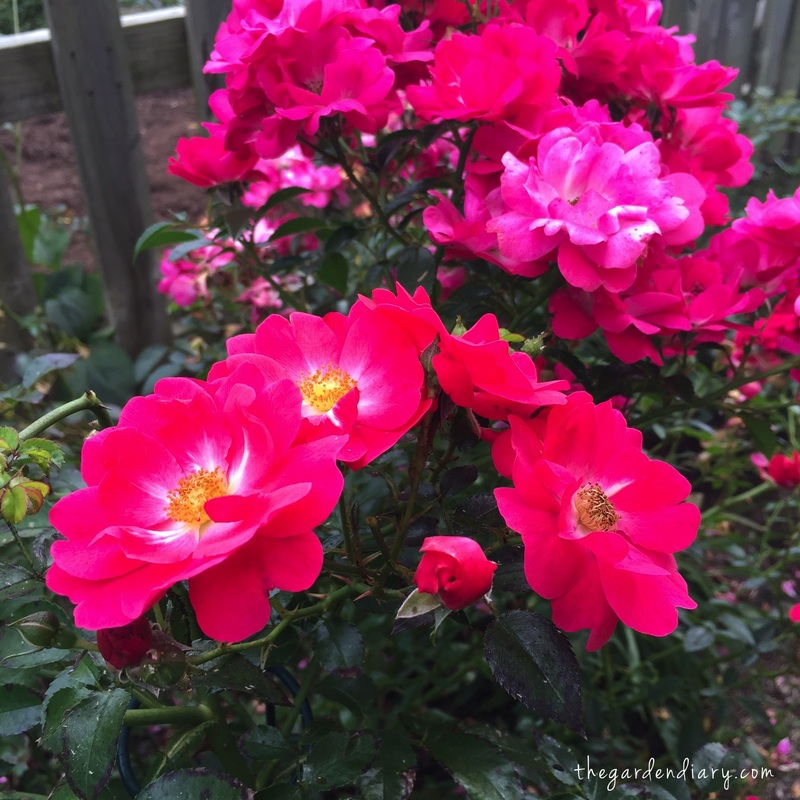 Rugosas are often referred to as “rugged roses” because they can take most any condition. 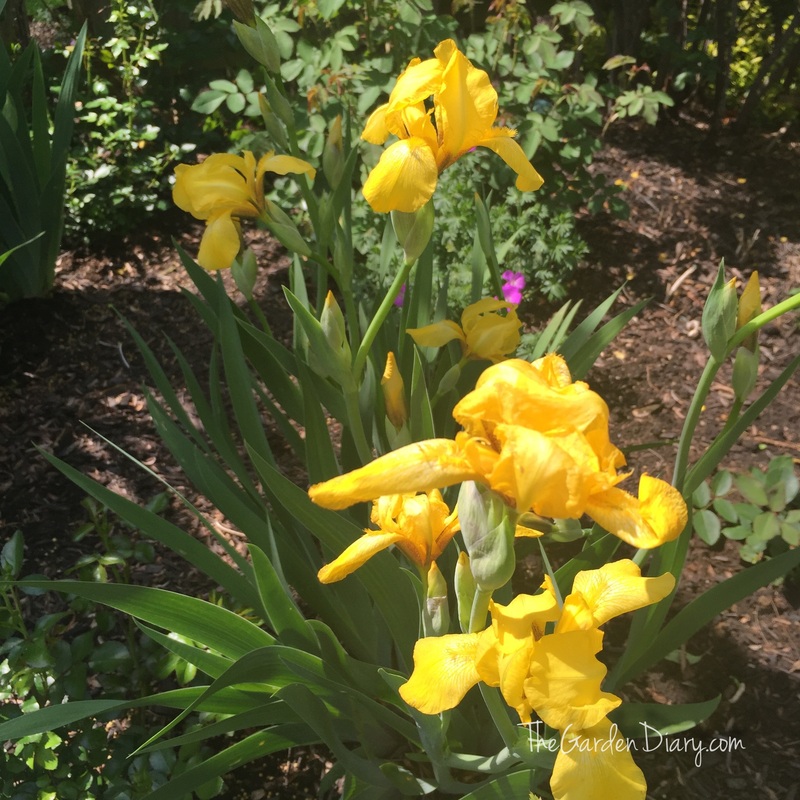 They are workhorses in my garden and they will most likely grow for you too. They are recommended for growing zones 3 – 9–which takes in a good many of us. If you are growing rugosas in the deep south, I would love to hear how they do and which ones you are growing. Occasionally I hear of people having trouble in our hottest areas. I have about 15 rugosas … Hansa, Roseraie de la Hay, Therese Bugnet, Moje Hammarberg, Belle Pointevine and Blanc Double de Coubert. They form a thorny, beautiful, fragrant backdrop. The spring bloom is the most spectacular, but they do repeat bloom if you deadhead! Here’s what mine are doing–in between downpours! The largest one you see here is Roseraie de la Hay. In front of the gate is Hansa. If you turn up the volume, you can hear the birds on the video! Here is the fist bokay of the season. 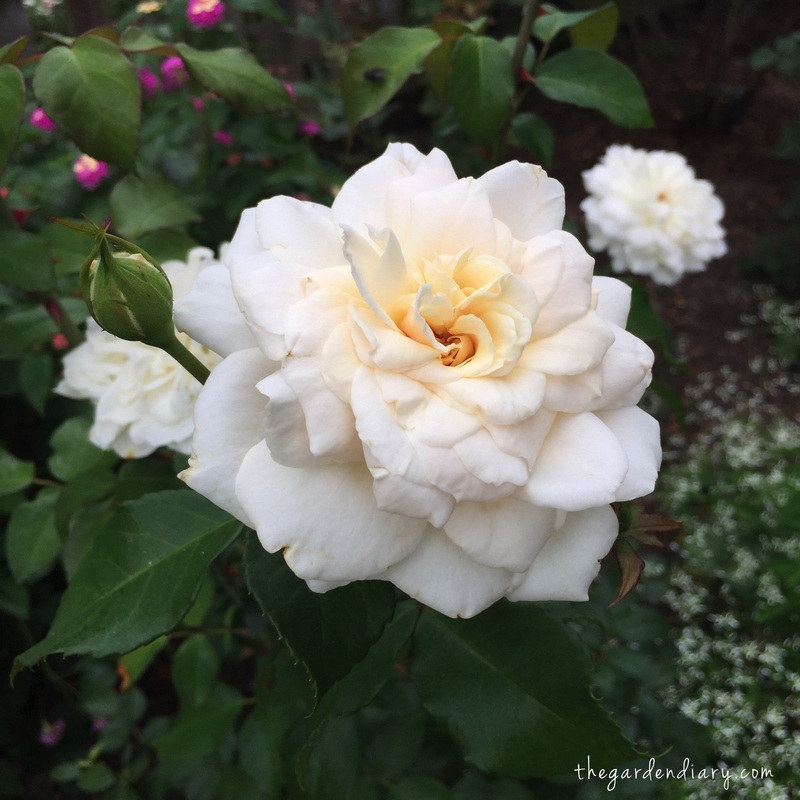 It may look gloomy outside this afternoon but it’s all lovely rose fragrance inside. Early or late, these beauties are always welcome. Look at this video of Peggy Martin today … all loaded up with blooms. She’s gonna be amazing–just like her namesake! Stay tuned! August is coming to a close. When you say goodbye to August, you say hello to September and that means fall is upon us. The garden is looking like a patchwork. Some flowers are blooming just like it is still spring and some have completely faded. The rugosas are sending up a few flowers but mostly are making their beautiful hips. The hydrangeas are fading into their fall hues. The crab apple tree that stands in the middle of many of my flowers is dropping it’s leaves and apples giving a distinct fall look. While I do miss the freshness of spring, fall in my world is filled with wonderful things! 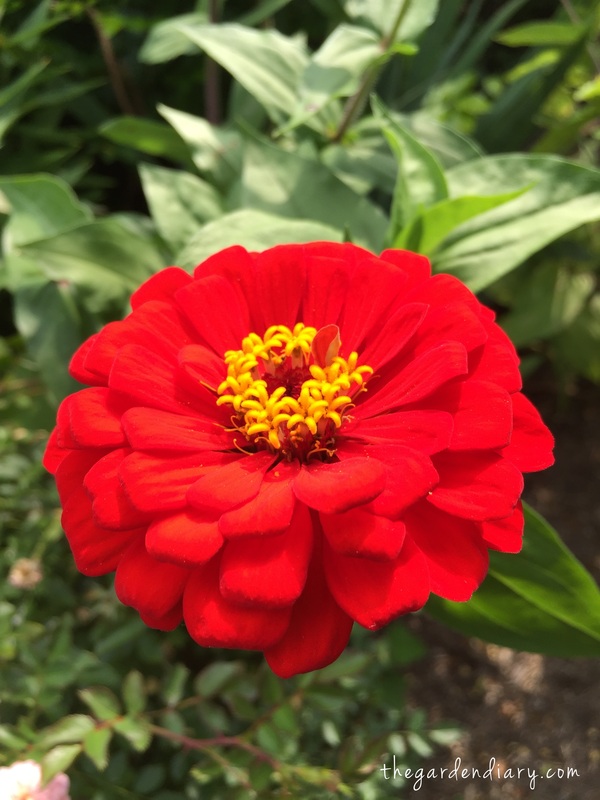 Zinnias are fabulous in the fall! 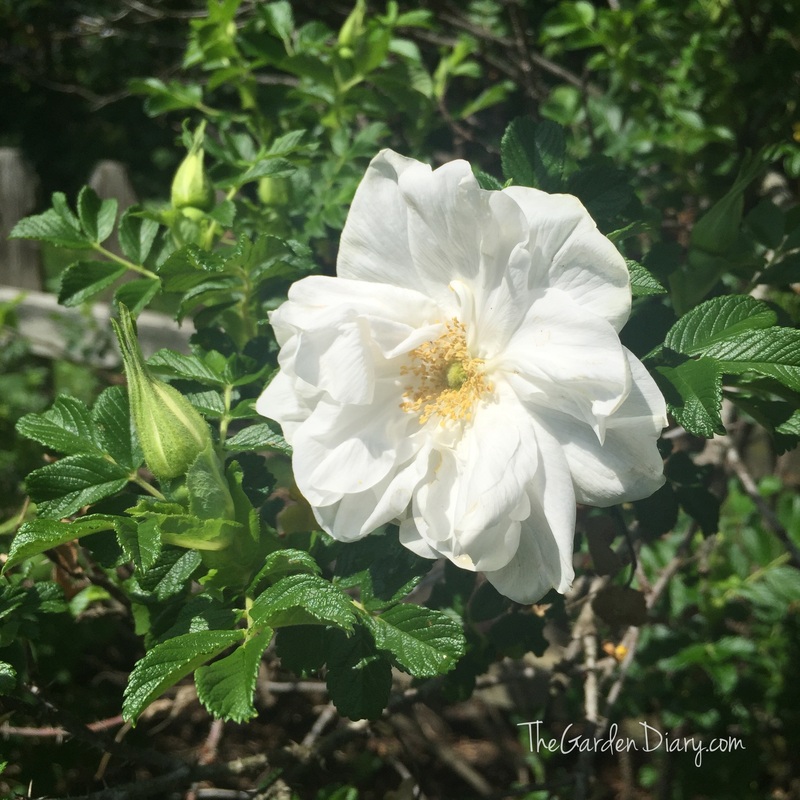 Quietness – a stunning, fragrant Buck rose. Available at https://www.chambleeroses.com/. 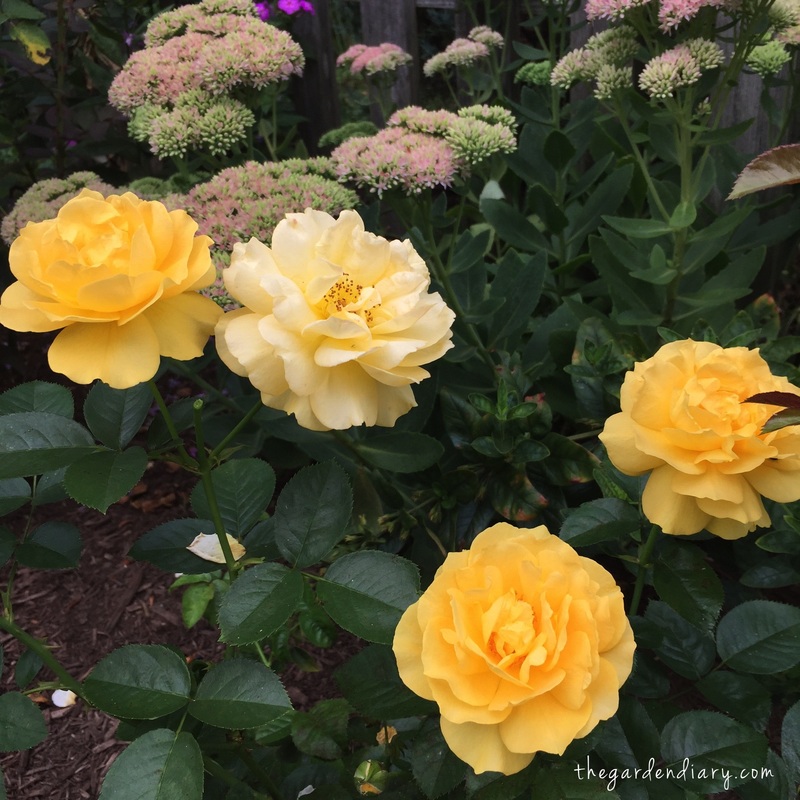 Apricot Drift Roses from Star Roses and Plants – still look like spring! In two weeks I will travel to Syracuse, NY for the American Rose Society’s National Convention. The Rose Chat crew will be interviewing rose lovers and hearing their stories as well as acting as Rose Show Awards Masters of Ceremonies. We can’t wait! If you are going to Syracuse, we look forward to seeing you. Come find us at our booth! 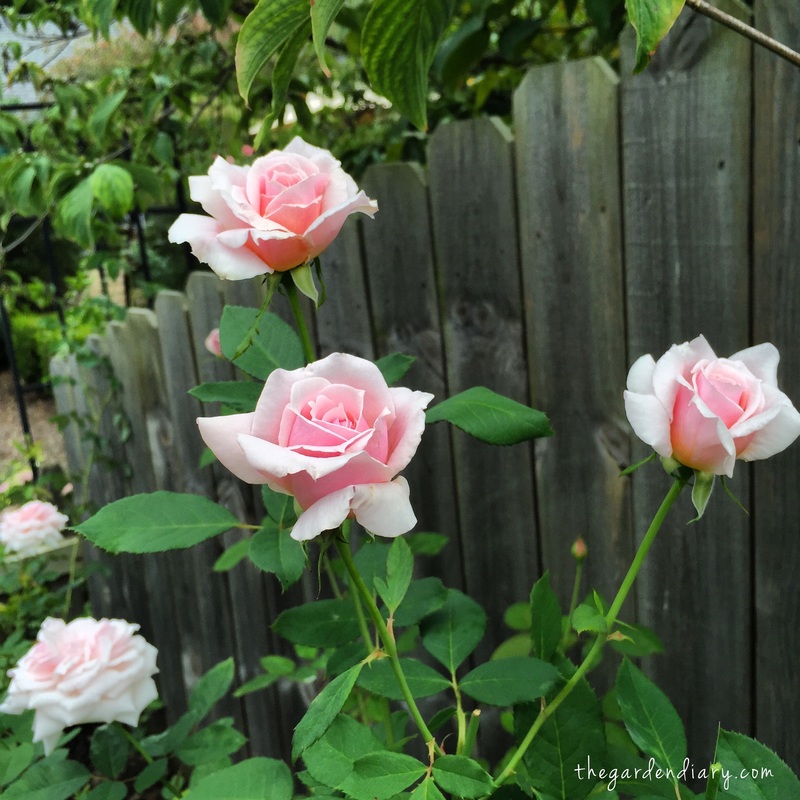 Rose Buzz: That was quick! 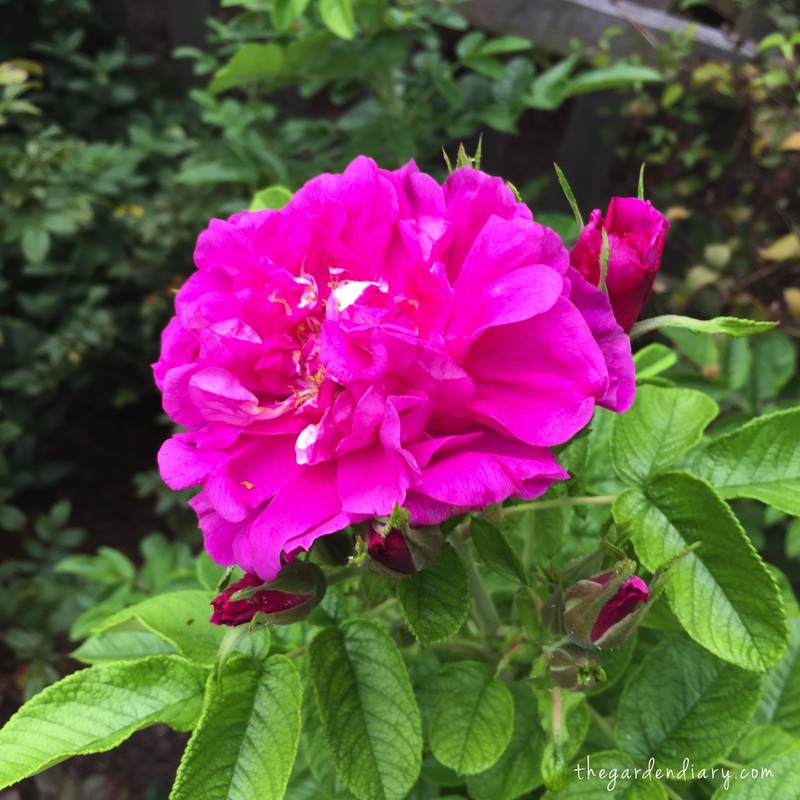 Today I made my last garden walk before leaving for P. Allen Smith’s Garden 2 Blog event in Little Rock, Arkansas. 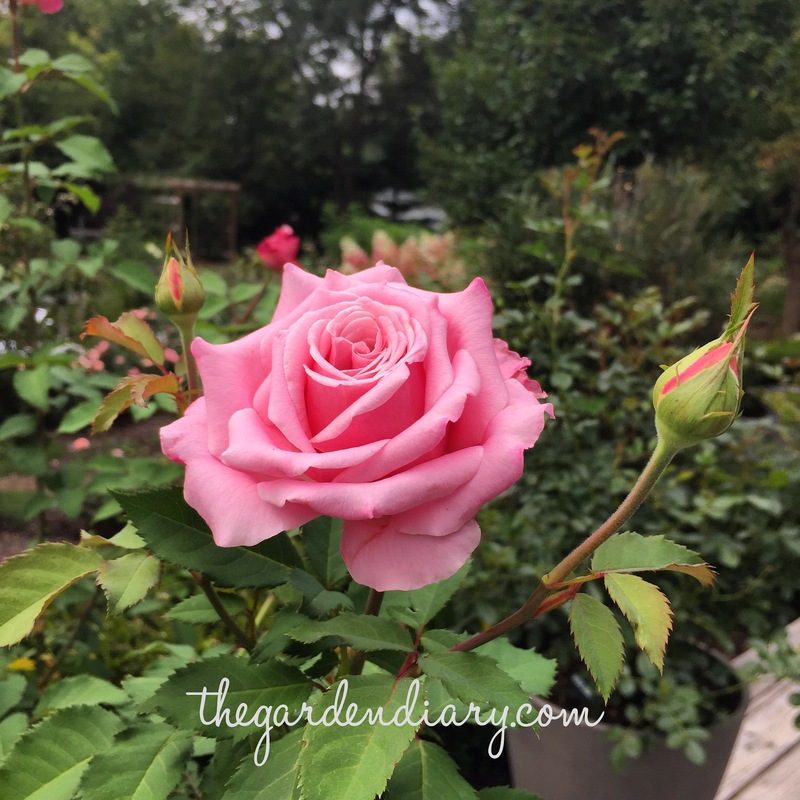 I simply can’t wait to be back at Moss Mountain with Allen and so many of my garden friends from all around the country … and Allen’s amazing rose garden should be at peak! More about this event here. More info and more pictures to come from Moss Mountain! 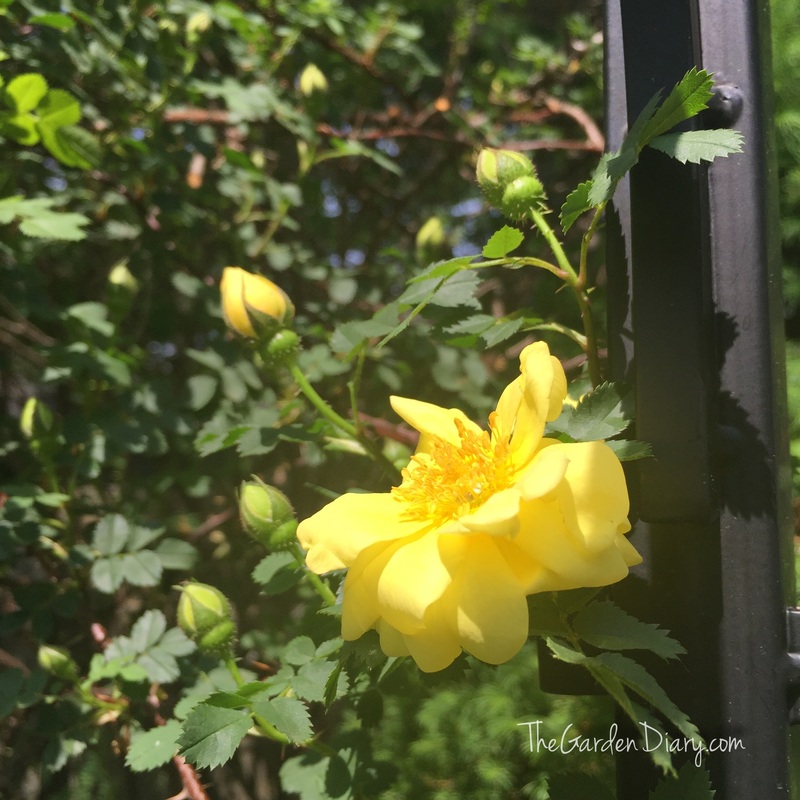 Often the first to bloom, Harison Yellow, the Pioneer Rose. Welcome back friend; it has been too long! Read more about Harison’s rich history here. The Rugosas (fireworks of the spring garden) are showing a bit of color and hopefully will stall for a week so I can “experience” their beauty and fragrance. 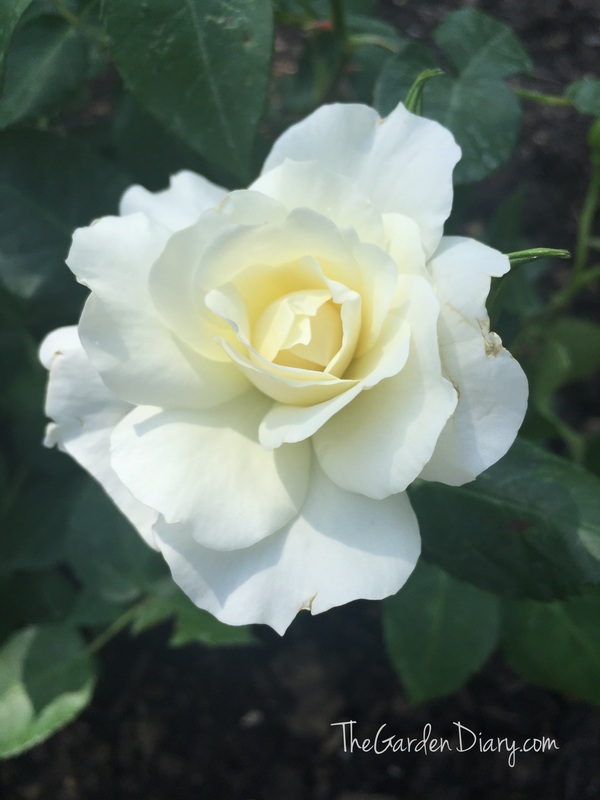 Rugosa Blanc de Double Corbert … fragrant! 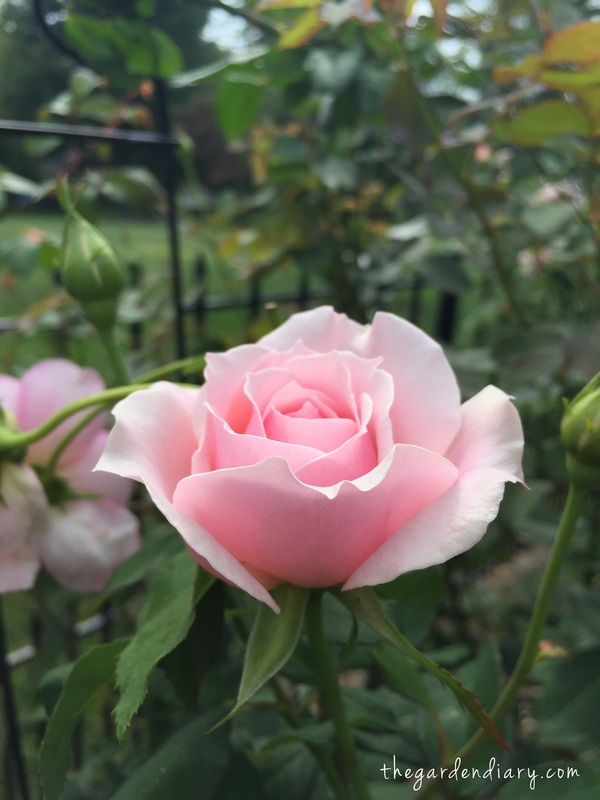 Champagne Wishes … this is a rose I just bought and it came with open bloom. 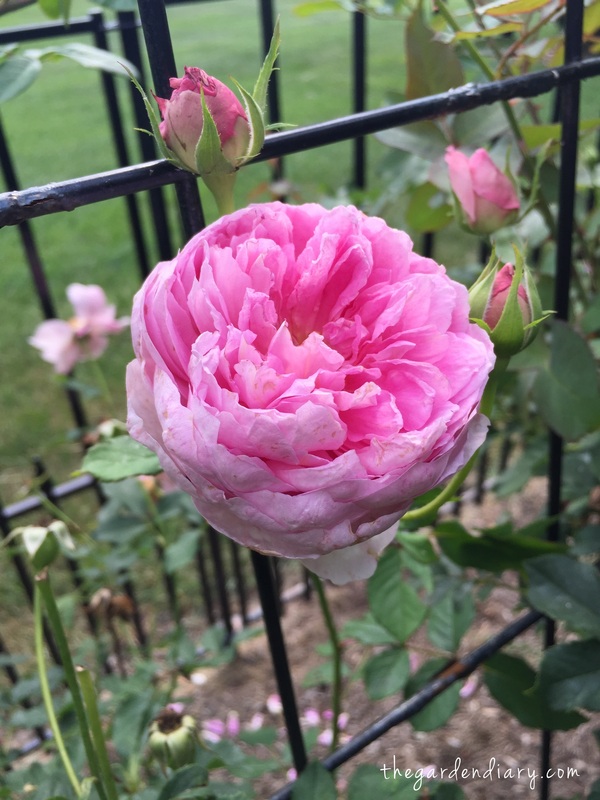 I think I am really going to like this lovely rose from Ping Lim’s Easy Elegance series. The tag line for this series is All the beauty but none of the work. I have several in this series and will share pictures and info as they bloom. Some of the rose companions are coming on strong as well. 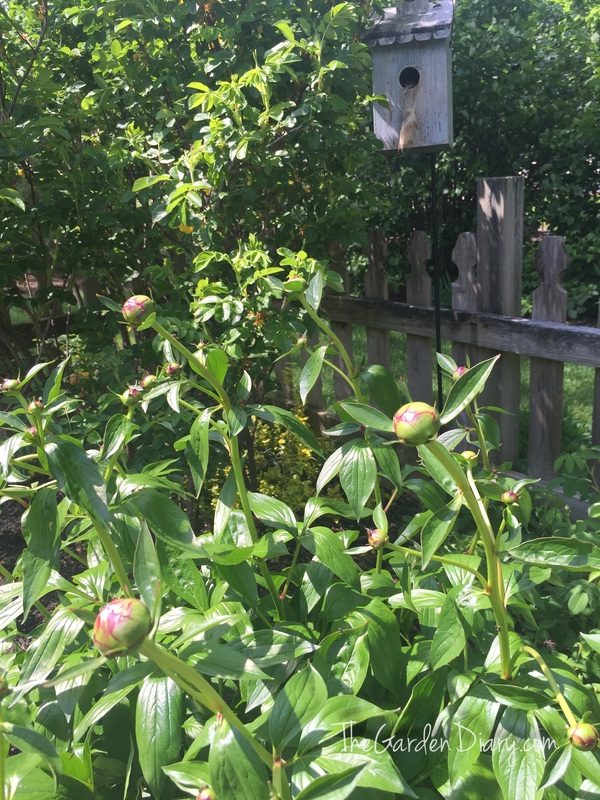 Peonies … should be stunning when I return! 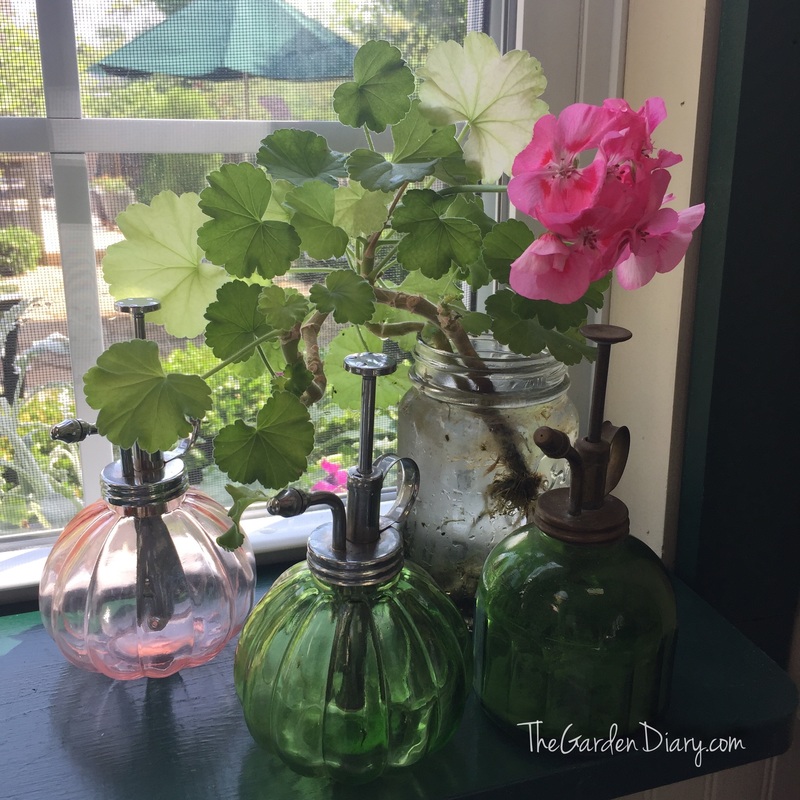 Even the geranium cutting in the potting shed is in bloom! How are things in your garden this week? 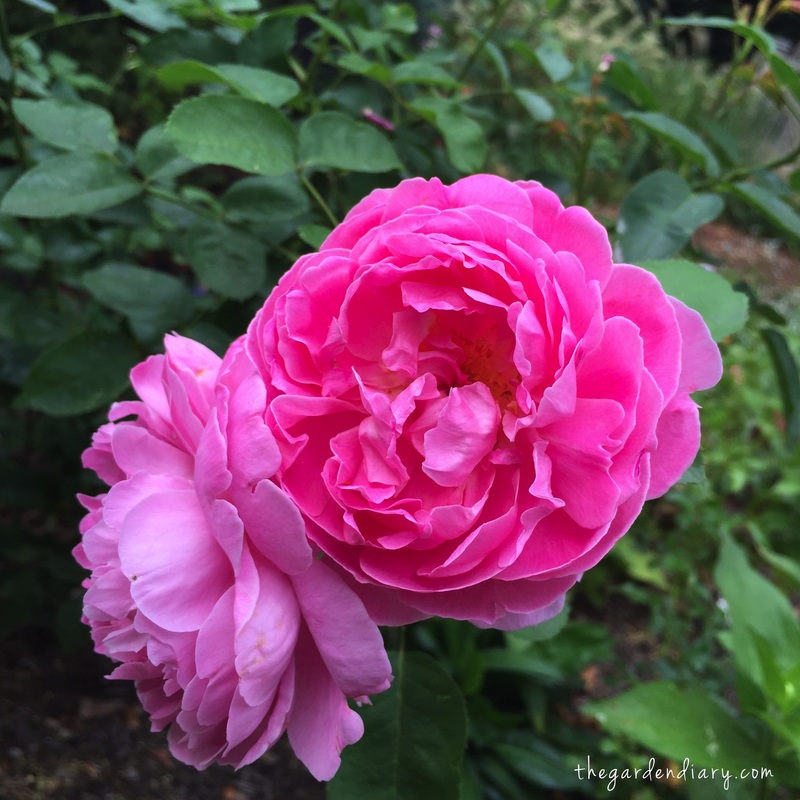 Have any Rose Buzz to share?